Students today face a very different future to that of their parents. The workplace is already influenced by increasing globalisation and technological change. With these advances in technology and media comes access to; an abundance of information, rapid changes in technology tools and the ability to collaborate and make individual contributions on an unprecedented scale. In this world of rapid change interpersonal and creative skills are becoming more highly valued in employees. According to the 21st Century Skills Lab “constant and accelerating change will mean that learning becomes much more important than knowing, with the focus on agile talent – workers who are constantly adapting and re-learning”. Students also need to be a resilient and able to live with change and the uncertainty that inevitably comes with it. The top 10 skills listed in the Future of Jobs Report by the World Economic Forum places complex problem solving, critical thinking, creativity and collaboration at the top of the list of vital employee skills. This demonstrates the influence of the technological and digital revolution and the importance for students to develop the transferable skills required for their future. These are known as the 6C’s: Critical Thinking, Collaboration, Communication, Creativity, Character and Citizenship. 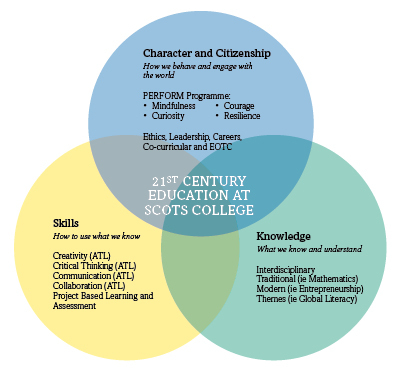 A key focus at Scots is to ensure students are well prepared for their life after school. That as well as providing the necessary knowledge to prepare our students for their futures we need to focus on the soft skills they will require to be successful such as emotional intelligence, social intelligence and cultural intelligence. Core competencies for all students are: transferable skills including the 6Cs, digital preparedness and well-being strategies to assist students to be resilient.